Gorkha Janmukti Morcha president Bimal Gurung today urged Muslims in the Dooars to join hands with the Gorkhas to redress common grievances. Addressing a meeting attended by the members of the Dooars-headquartered Bharat Millat-e-Islamia Society at Bhanu Bhawan in Darjeeling, Gurung said both the communities had been at the receiving end of the state government's apathy, and it was imperative for them to join hands for a common cause. "Let us both hold a big meeting in the Dooars and put out a show of strength. You bring about three lakh Muslims and we will bring equal number of Gorkhas and let us demonstrate our strength. Both the communities face a crisis of identity in our own country. We must work unitedly to address this," he said. 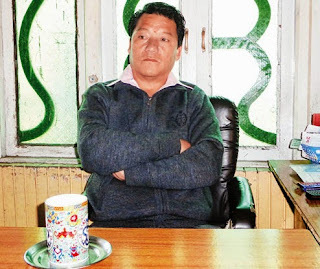 Imtiaz Khan, the secretary of the Islamia society, said the Muslim community was reaching out to Gurung to address their myriad problems of education, unemployment and development. "The Morcha president has been very sympathetic to our problems, which primarily relate to education, unemployment, health and development. We are here at his invitation. We will reach out to the state government and the Centre to get our problems addressed. We have nothing to say on the Morcha demand for Gorkhaland," he said. Asked if the Muslims wanted the Dooars to be included in the GTA, he replied in the negative. Observers said the Morcha was trying to broad-base its appeal in the Dooars by wooing non-Gorkhas like the adivasis and the Muslims. "Look, the Morcha has managed to woo a section of the adivasis by aligning with John Barla. It hopes to do the same by aligning with the Islamia society. The Muslims have a strong presence in the Dooars. However, we are not certain about the hold of the society in the Muslim community of the Dooars," said an observer.